Description - A group of kids try to prove their grandfathers' innocence of the largest theft of artwork in history. A small budget project that has already won four screenplay competitions last year. KIDS FIRST!® Adult Jurors say - Greatest strengths are the story line and the tween characters. The dialogue is pretty believable. The setting in Boston is appropriate. It's a cross between Goonies and Oceans 11, with tween heroes and contemporary twists. The kids use their technology to do research and track down the culprits in the story, making it very contemporary. They play detective in an effort to clear their grandfather's good name. 8 of 10 points. The screenplay makes a lot of sense until it comes to a conclusion on page 64 but then circles back to recount the last portion of the story, almost play by play. That does not make sense. We already come to a conclusion and then it's recapped. A bit of that might make sense but not to the degree shown here. Kenzie is the strongest character both as leader of the "band of 5" and the granddaughter of Harry Miller. The other kids are pretty well developed though none stands out as much as Kenzie does. Herne the cop is fairly well developed but the others don't stand out much. Kenzie's wit and good nature are well played and Herne is the brute of her jokes at times. In terms of pro-social modeling, Kenzie exemplifies her love of family in wanting to clear her grandfather's name. She is also a positive role model when dealing with her peers in the "band of 5." Again, it is Kenzie's lead to investigate and solve the mystery of the missing artwork as well as the scholarship funds. She is relentless. The ending is horribly messy. It ends at page 64 and then starts back in again. It's almost as if the writer forgot to delete that version of events. I didn't see any glaring grammar or spelling errors. I do have some issues with mild profanity (Damned, pg. 30) and inappropriate language for youth (I needed that. Was it good for you too.) (wife having an affair with their accountant). Just unnecessary in a script geared for a youth audience. YES - Meets or exceeds the KF criteria, is appealing and engaging. For the most part, I found this screenplay well thought out and well written. I could easily visualize it transformed into a film on the big screen. The characters are engaging and interesting. They storyline is appealing. The shortcomings are some mild profanity, inappropriate language with sexual references and an awkward ending. If those are fixed, I would give it a higher score. As it is now, I give it 3.5 out of 5 stars and accept it for KIDS FIRST! Description - Considered to be forbidden by the villagers, main character Surreal is guided by her instincts and regardless sets out on her own to discover "The Place of the Gods." Once there, she comes across significant realizations. KIDS FIRST!® Adult Jurors say - I rate this 3 out of 5 points, because it lacks a strong storyline and substance. Although it is based on a short story by Stephan Vincent Benet, not everyone has read this story. I am not sure if all teenagers will get what's going on here and it is most suitable for teens. Recommended age: 12-18 It lacks a strong story line and focus. Although I get the main point, I don't easily picture it on the big screen. It is an interesting read but feels that it needs more of a story line. From the stand point of a script, I feel as if I was reading a book or essay, not a screenplay because there are so many descriptive words of what is going on. Stronger dialogue would help a lot. The target audience is for older teens and adults, since it is after the world is pretty much destroyed. The storyline needs further development. It lacks strong direction and sort of fizzles out without taking us anywhere. I rate this 3 points because the storyline needs more work. It shows how the protagonist realizes that the Presidents were human, not Gods. But it also insinuates that they were not intelligent and I had a hard time with this reasoning. Presidents such as Lincoln and Washington were not Gods, only men. I don't think the theme is strong enough. There should be more of a main point. I give this 10 points out of 25, because the storyline is not a strong and lacks development. I could see this developing into something very interesting, but as it is we just get a glimpse of one scene. I would like to see the writer develop this into a full length script. The characters lack depth. The main character, SURREAL is the strongest and although the other characters are minor, I would like to see them more developed. I didn't really feel like I got to know or understand them. I rate this aspect with 6 points. This is where it is really lacking. I give this 6 points. I don't feel that it gives children a real understanding of the world, especially with the focus of how Presidents were before the apocalypse. There is a lesson, but it is not strong. The story line really needs more development. Surreal seems to think that life in her day is much more intelligent, but, I don't see how SURREAL really proves that in the script. I wouldn't say that the script encourages questioning or probing. It could, with more development. It is suitable for the intended age group. The storyline needs more substance and a reason for its purpose. I would like to see a stronger focus and I would to see teenagers curious about the purpose of the story. There are not too many grammar and spelling mistakes. Qualified yes. Meets KIDS FIRST! criteria. Needs more work. It's possible that if I read the short story this script is based on, I might better appreciate the adaptation. However, a screenplay should stand on its own and not require the reader or viewer (once produced) to go back to the original source material. I accept this with the caveat that this is a good start, but needs further development. As it is, I do not find the story line strong enough. The main character is likable, but I the minor characters lack development as does the entire story line. It's a good start. KIDS FIRST!® Adult Jurors say - I wasn't sure what to expect when I first started reading this. I understood that it was about a team called Monster Commandos and was pleasantly surprised to find out that it's about a group of teens. The story line is creative and flows well. The development of the characters shines through. The characters are my favorite part of the script. It is entertaining and treads lightly on family issues such as abuse and divorce. I would have liked to see more of a resolution between Justin and his abusive Mom, but in reality there isn't always a happy ending. I give this 3 out of 5 stars recommend it for ages 13 though 18. Happy to give this a KIDS FIRST! endorsement. Reviewed by Denise B., KIDS FIRST! Juror. Description - Princess Lillian, the daughter of a cowardly king, must shed her fear as she searches for her lost knight that was snatched by a dragon. Fog Rider, a mediocre superhero, hunts for his magical orb that can destroy both of their worlds before the evil witch can discover its power. The two unlikely allies learn to work together to achieve their goals. But their secrets and lies create unexpected twists as they battle exceptional creatures, like spider-snakes and a deadly, foul-smelling unicorn. KIDS FIRST!® Adult Jurors say - I recommend this script. My favorite aspect are the characters. I like that Princess Lillian is a strong girl role model and Fog Rider is much more than expected. The story line flows well, is unusual and refreshing. I give this 21 points out of 25; recommend it for ages 10 through 18. The characters are solid. I like that most of the conflict is solved and there is a happy ending. Reviewed by Denise B., KIDS FIRST! Juror. Description - In present-day Arizona, with the help of his basketball coach, a teenage boy overcomes his parents' separation, and, death of his best friend. Description - A law and order kid spends a week with his outlaw Grandma. After Grandma commits an outlandish felony, Andrew Crandall has to decide which is more important - rules or family? KIDS FIRST!® Adult Jurors say - The overall story is a bit unbelievable and quirky and that is part of its appeal. The characters are likable and the story flows well. I like that it has humor and is engaging yet there is a subtle message about family and giving second chances. I recommend this for teenagers and adults as well and would rate this 4 stars out of 5 and recommend it for ages 12 to 18. It is quirky, different and interesting. In an unique way it teaches that family members can learn to love each other or at least tolerate each other and deserve second chances. One of the greatest strengths is that the story is different and has humor. The characters are quite well done and I even found myself liking Grandma and although I am glad she's not my Grandma, the character really adds to this story. I would have liked to have more detail in exact location in the very beginning of the story but over all, it was quite well done. I do think that teenagers will find it fun to watch. Grandma is not your typical Grandma and she actually is a bit twisted but I actually felt more compassion towards this character as I continued to read and I think that viewers would feel the same way. Also, I think a lot can be done with the scenes when Andrew and his friend stay with Grandma. it is a fun story that has entertaining value. The plot is engaging and has a few twists. The characters are quite well done and it flows well. There is a bit of conflict between the characters because Grandma was a bad Mom to her son (the Dad in the story) and I felt the resolution was not over the top but that it ended well and was resolved. it is entertaining yet there is a subtle message about family and giving family members another chance even if they don't completely change. I think this is a valuable lesson for teenagers to learn and although most teenagers won't have Grandmas like this one it may make them appreciate their grandparents or see the in a different light. Description - Emmi, excited to join a youth racing team, finds herself immersed in the futuristic game and in life's unexpected struggles. With the support of her teammates, she finds that friendship can carry you through your toughest challenges. KIDS FIRST!® Adult Jurors say - This is a great story with lots of potential. It flows well and the characters are extremely well developed. I like how it is more than just a story about skate racing. It teaches about compassion and even has a couple of scenes that made me tear up. It is engaging and I think that it would be fun to see the actually skate racing on the big screen. 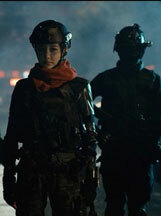 I loved the characters especially Jet and Starcaster but their team mates were also quite intriguing. The only weakness is that there are a few grammar and spelling mistakes but they can be easily fixed and I do highly recommend this script. I would give this 4.5 out of 5 stars. Recommended for ages 8 to 18. Accepted! Reviewed by D.B. Description - HOLLY STEPHENSON, 17, is the daughter of starship CMDR. RICHARD STEPHENSON, with whom she has been undertaking the loving labor of fully restoring an archaic spaceship, Bradbury, which they hope to enter in a space show in a year's time. But on the eve of her 18th birthday, alien invaders, slave drivers, possessing superior weapons, appear just outside our space and abducts the crew of the IDS Victorious--including Holly's father. All Coalition efforts to neutralize this new threat are easily thwarted, the sleek, STATE-OF-THE-ART ships vulnerable to the Vammorian technology. With bold, and perhaps foolish, determination, Holly commandeers an obsolete starship called Bradbury, which seems more suitable for a museum than battle, and, along with her brother and her snarky CPS personal computer named Cyprus, she sets off in pursuit of her father around the galaxy. Adding to the struggle is this: the neural transmitter both daughter and father had implanted within their brains, since recalled due to adverse effects to the bearers, are all that link them over the light-years. Will Holly find and rescue her dad before succumbing to the increasingly deleterious effects? Or will her raw determination be enough from keeping Bradbury fighting long enough to find and rescue her father and deliver a crippling blow to the hostile invaders she races to engage? KIDS FIRST!® Adult Jurors say - The story line could be more engaging with maybe a few twists and unpredictable scenes. It is overly predictable. There are quite a few grammar mistakes especially with the misuse of your and you're. That being said I give this a Qualified Yes and, with changes could rate higher. I like the characters and they are a strength in the script and I love that the main character who pretty much is the hero in the story is a female. I think that is a real positive in the script. I give this 3.5 out of 5 stars and recommend it for ages 8 to 12. Description - In the wake of his father's death, Mark Taylor thinks he and his son, Evan need some quality time together. He is certain that a weekend at the family cabin in the Missouri woodland presents the perfect opportunity and will strengthen their bond. But as darkness falls, their stay becomes a terrifying fight for survival against a savage night creature straight out of the annals of cryptozoology, with little more than faith, desperate courage and a single cabin door providing their only means of defense. With Mark badly injured, dawn too far away, their generator running out of power, and no means of calling for help, they are ultimately left with a single heart-rending option that might let one of them survive to see another day. KIDS FIRST!® Adult Jurors say - MOMO is a thriller and that is what makes it entertaining. The story flows well and the characters are well developed and I liked the dialogue between the Dad and his son. There is meaningful dialogue about being who you are and not changing fro someone else. There is also a happy ending and I liked that the main characters didn't die. I recommend for tweens and teenagers ages 9 through 18 and I would give this an over all score of 20 points out of 25.m Reviewed by DB., KIDS FIRST! Juror. Description - RON PETERSON works for the enigmatic Halley-Byrd Institute. Several months after his wife leaves him and his adopted daughter subsequently runs away, he is give a case which involves two young adults who have been admitted into the hospital with injuries sustained in a cave-in at a construction site--found inside a heretofore hidden cave! Ron reports to the hospital where he is introduced to a girl, who looks to be of Native American descent, dressed in suede and leather, but whose clothing appears to have electronic components sewn within. The other youth, a boy, dies in the next room, his injuries too severe. After a briefing with hospital administrators, whose cooperative history with the Institute goes back some time, Ron visits the girl, now conscious, in her hospital room. While she speaks a Native American tongue, and no translator is available, Ron manages to bridge the communication gap enough to learn her name is ELIYSO. Eliyso bridges the gap significantly when powerful hunters, BALOS and WILANA, toting futuristic weapons storm the hospital in search of the slave girl, and the only way she can communicate the danger imminent is by initiating a telepathic link--a "joining" with Ron, which allows them both to speak either of their languages. After barely evading capture, and cut off from his supervisor, Ron learns from Ellie that she hails from a subterranean civilization. She knows she must journey "west" to the only safe haven for her What's more, the "joining" is more than telepathic in nature; it is symbiotic. And with each passing moment, the bond between Ron and continues to grow in strength. Can Ron get Eliyso where she needs to be, before the "topworld" sun hastens her demise or Balos and Wilana catch up with them to drag her in chains back into the depths? KIDS FIRST!® Adult Jurors say - I like this script because the story line is well developed as are the characters. It has entertainment value and I believe that teenagers will enjoy the action and that it is unpredictable. I rate this 20 points out of 25 and recommend it for ages 12 through 18 years old. I like that there is slight humor and that it flows well. Description - This film is set in 1939, on the cusp of World War II. It follows a young African-American orphan boy (Danny) who narrowly escapes a KKK lynching and then literally stumbles upon bandleader Duke Ellington's private rail cars, is discovered as a stowaway, and is "adopted" by Ellington and the members of his band. Danny's adventures with the Ellington family lead to his eventual achievements in life as an adult. KIDS FIRST!® Adult Jurors say - I am impressed with how engaging this story is. My favorite aspect are the characters and how it shows a time in the 30s when jazz was popular and also gives a glimpse of how whites treated blacks. It isn't overly violent and is primarily a positive story. The dialogue is extremely believable and it flows well from beginning to end. Recommended. KIDS FIRST!® Adult Jurors say - I really enjoyed this holiday script that addresses not giving up and also shows a view of Christmas with a non-materialistic view and shows the special family bond of a family that is homeless. This is definitely a feel good move and appropriate for young children and would be a great family friendly movie. I rate this 4 stars out of 5 stars because I really enjoyed the characters and their dialogue as well as the unique story line. The scenes are very detailed and I could see this as a beloved annual holiday TV movie. I recommend for ages 3 to 8 and their families. Description - Milton Riggles, age 14, nerd, loser, president of the Frog Club becomes involved in a life and death situation when his science teacher and mentor disappears and weird sightings of humanoid frogs jumping around the neighborhood. Milton and his side-kick Jenny begin to focus on the Frogspawn Laboratory Industry. When our undaunted duo begin their investigation they encounter the evil Doctor Prince, head of Research and Experimentation at the Frogspawn Corporation headquarters. A villain ready to cash in on gene splicing with a miracle drug that can change the course of human evolution and the coming of global warming. Now Milton and Jenny are in a nail-biting situation to stop the sinister Doctor Prince from turning the world into evil huphibians. Sometimes evolution makes a giant leap, sometimes it just takes a hop. 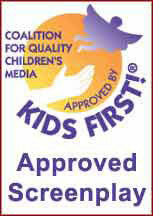 KIDS FIRST!® Adult Jurors say - A definite yes. This is an interesting and engaging story and the characters are a very strong part of the screenplay. There are a couple of subtle messages for teens about not judging others too quickly and getting to know them, but most of its value is entertainment. The story flows well and there is conflict and resolution with a good ending. It is a bit predictable, but I think it would be well received by teenagers. (mine enjoyed the story) Reviewed by Denise B., KIDS FIRST! Juror. Recommended for ages 12 to 18. Ranked 4 out of 5 stars. Description - The friendly Grim Reaper Junior is not a chip off the old block, leaving his dad open to being hoodwinked by the evil Birthday Candlewicks. KIDS FIRST!® Adult Jurors say - This screen play is not what I expected and I mean that in a good way! The ones I thought would be bad are the good guys and the ones I thought would be good...are bad. This is a refreshing change! I really like the imagination and creativity of the characters and the story line and could see this as a movie that tweens and teens would enjoy. I recommend it for ages 8 through 18. I also like that it is entertaining but has a message about not changing for others and being yourself. I give this 4 out of 5 stars. Reviewed by Denise B., KIDS FIRST! Juror. Description - Minnie Hughes is a hardboiled noir detective that also just so happens to also be the shortest girl in the fourth grade. When a candidate for class president's show and tell South African ostrich egg goes missing, Minnie jumps on the case. Meanwhile, she also deals with her best friend Lincoln Park feeling under appreciated after she calls him her secretary and struggles with asking her crush, Vijay Sampat, a kind of male femme fatale, to be her dance partner for gym class. KIDS FIRST!® Adult Jurors say - The script was enjoyable to read. The term Film Noir (French for suspense film) is most likely a double-entendre since the main character is African-American and is a mystery solver. Strengths- Multicultural cast of characters, main character is an African-American female, which is unusual for any story. Weaknesses - One character is a bit stereotyped. Yes because the WHODUNIT mystery theme is very universal and the school setting makes it relatable to most viewers. Theme- Helping another out in a time of crisis and helping them receive justice. In an increasingly terrifying world and last years headlines exposing injustices against women, Kids need to know that they can attain control over some situations and feel empowered. Plot and Structure- Narrative Logic: A good example is when the viewer can sense that Minnie will get to dance with Vijay when in gym class by the end of the story. Emotional Impact: the best example is when the viewer wonders where Minnie's parents are (or what happened to them) at the synopsis' conclusion. Dramatic drive: a good example is when Vijay kicks open the bathroom door and Dash appears with a bloodied nose. Structure of the storyline: Introduction of characters and story, mystery to be solved, finding the culprit, and conclusion are clear and straightforward. Characters and dialogue: Minnie is the most thoroughly developed character because she is the main protagonist. She is quick-witted and adept, yet comes across as bashful to her crush Vijay, and is annoyed/irritated by her ally in crime-solving, Lincoln. The characters, such as Lincoln and Dash, are not as fully drawn out. They can be described as geeky and devious, respectively. Dialogue- an example of the wittiness, humor, and power in the dialogue includes Lincoln injecting comments at Minnie which irritates/annoy her, but makes the audience laugh. Rhythm/ pace: script does not seem to lag and is easy to read from beginning to end, making it a good film production choice (viewers would not zone out.) Tone of script is light-heartedness. Narrative voice: Minnie is the type of character who is driven and will fight for justice of the deserved and will not stop until she finds the justice. Nothing will get in her way. Highly recommended for ages 5-8. Reviewed by Kimberly M., KIDS FIRST! Juror. Description - A young girl fights to save her town from an evil farmer who wants to transform it into a giant pig farm, while rediscovering her mother, who died when she was just a baby. KIDS FIRST!® Adult Jurors say - This screenplay is very engaging. It has great characters, a story line that flows well and a happy ending. I also like the subtle way a young girl and her father are able to bond over the past death of the mom / wife in a more positive way. The dialogue is natural and realistic and I can see this on a big screen. There are few grammar and spelling mistakes and over all it is entertaining and has lessons to be learned. The characters are my favorite, especially Emma and her dad Basil. The dialogue is done well and, although it is a bit predictable at times, it does hold your interest. I wanted to keep reading to discover how it ends. The one weakness is that I wasn't quite sure how the bad guy ended up with the winning pig that belonged to someone else. I suspect that he paid Percy's father for it but would have liked for this to be clearer. I believe it has commercial potential and like that there is a soundtrack and descriptions of the scenes. It's a realistic theme that resonates with today's environment, where the rich and powerful try to own everything, yet it ends well. It does have conflict and resolution, and the story line is done quite well. It flows well and the characters are natural and realistic. It has a bad guy but he actually changes at the end, which is a nice twist. I liked how well the dialogue is formed and how natural it seems. It fits the characters and flows well. I like that one of the main characters, Emma is persistent and does not give up easily. She is a good role model. I also like that the rich and powerful do not always win. Kids could be asked what they learned from the story and who their favorite character is and why? I would possibly make it a little more straight forward about how Bulbous Swigbottom (what a name!) gets hold of the pig that wins. Did he steal it or did he pay for it? I found very few grammar and spelling mistakes. On page 11 there is one sentence that needs correction: She is doesn't seem to know anyone. But, over all there are few mistakes. YES ! Highly recommended. It meets or exceeds the KIDS FIRST! criteria, is appealing and engaging. Description - Scottish siblings, Erin and Owen Macdonald, are swallowed by The Loch Ness Monster and brought to the magical land of Mythatania where all creatures heard of in Myth and Folklore have gone to escape the outside world. There they meet THE MYTHFITZ, a group of mythical youngsters and embark on a wonderful adventure. KIDS FIRST!® Adult Jurors say - MYTHTANIA is a made up place with mythical creatures that are entertaining and fun to read about. I can imagine this film on a big screen with amazing scenes featuring the creatures and humans. It has conflict, resolution and lessons to be learned about pride, friendship and working together. The characters are the strongest aspect of this screenplay. I loved the dialogue and scene descriptions. It is entertaining, fun to follow and flows well. Besides that, there are some moral lessons to be learned about friendship, pride and not being a bully. It has amazing mythological creatures and some pretty cool humans. The scenery descriptions are really done well. I like that there is a reference to the music soundtrack. I do think it has the potential for some pretty amazing scenes. It is entertaining and, although it is mythological I believe that teens would relate to the human characters, especially Owen. I also think the dialogue is realistic and there is adventure and humor. There is conflict when the two human kids show up in MYTHATANIA and it is resolved as the two kids become friends with the creatures. I really liked how UNEE the Unicorn learns to swallow his pride and learn what friendship is all about. The Characters and dialogue were my favorite part so I would score this with 23 points out of 25. I felt that I got to know the characters and look forward to reading about their future adventures and I got the impression that this is more or less a series. I think that the script is done quite well and I don't really have any changes to point out. I did find very few grammar, spelling and punctuation mistakes but nothing problematical. A good copy editor could take care of that. I recommend this for ages 11 to 8 and rate it 4.5 stars out of 5. Description - Bug wants nothing more, than to earn the respect of his big brother, Tobi, and his friends. Eager to prove that he can hang with the big kids, Bug uses a cheat code, for their favorite video game, that he found online. Instead of instantly making him a master of the game, however, it transports him, and his brother, to an elaborate, virtual world, where they meet new friends, and battle strange, and powerful adversaries. Now, they must learn to believe in themselves, trust in each other, and ultimately win as a team, in order to beat the game and return home. KIDS FIRST!® Adult Jurors say - This screenplay has great entertainment value and I can picture it on the big screen. It is a modern day story. The characters are likable and well developed. It tells an appealing story and, although there have been other stories or movies where the characters explore the virtual reality gaming world, this story stands out enough with its differences. It flows well, has an easy to follow story line and will entertain children. There is a subtle message about teamwork and getting along with others, especially younger siblings. The story line flows well from beginning to ending and is appropriate for the target age. The characters are a strong point and I found them quite entertaining. Their dialogue is believable and kids will relate to the story. There is conflict between the younger and older brothers and I like that there is a resolution where they learned to work together. The only weakness was the ages of the two brothers. To make it more realistic, the younger brother should be a couple years older or the older brother a couple years younger. Five years is a big difference in age, especially in the beginning with the school situation. Realistically I think the ages being closer would make more since the 7-year-old seems a little older in his behavior and the older brother could be 12 but seems more like 10 years old. I can picture kids in this age range speaking the way they do in the script, so the dialogue is very believable. I believe that it has potential and that the scenes in the Game World are particularly entertaining and would be fun to watch on a big screen. This is well written with very few grammar, punctuation or spelling mistakes. It flows well from beginning to ending and the characters are all developed. It meets or exceeds the KIDS FIRST! criteria, is appealing and engaging. I give this 4 out of 5 stars and recommend it for ages 8 to 18. Some adults may enjoy it, especially if they like gaming. Reviewed by Denise B., KIDS FIRST! Juror. Description - Starflake is a Cosmic Pixie, who can live in outer space without any life support. A Deep Space Ranger enlists Starflake's help because kids have been vanishing from a Laser Tag Arena. Star flake discovers they are being taken to a distant planet where they are forced to work in the mines of Spelunk. Using her wits, she frees the kids and captures the villain, Sync. KIDS FIRST!® Adult Jurors say - Laser Tag Princess from the Starflake, the Cosmic Sprite series is a kind, unique and positive character who is kind and helps others. The comic book is engaging, entertaining and the illustrations really bring the story to life. This is a great start to a series of many adventures. Its storyline flows well from beginning to end and leaves you with the feeling of wanting to read more about Starflake's adventures. It is engaging and fun to read. The illustrations are colorful, detailed and catch your attention. Starflake is very likable character and quite unique. There is plenty of action to capture the attention of young viewers. Kids will like the characters and find the story refreshing and different. It is primarily entertaining, but there is some social appeal since Starflake helps others and is a positive role model. I give this 4 out of 5 stars and recommend it for ages 8 to 18. Description - Starflake, is little white-haired girl who lives on an asteroid in the asteroid belt of the planet Silver Valley. She is a Starbabe, a being who can exist in outer space without any need for life support. A rogue team of four Deep Space Ranger Cadets, mounted on rocket cycles, is on a mission to rescue their fellow cadets who are trapped on the planet Kafka, under the control of the mad alien computer, ALIEC. When they run across Starflake (Star), they see in her a being who can maneuver the slim vent leading to ALIEC and not be bothered by the poisonous atmosphere surrounding ALIEC. Thirsting for adventure, Star joins the Bikers. They land on Kafka, and set up camp. At first they want Star to take a bomb to ALIEC, but since they have begun to care for her, they think it's too dangerous and decide to use a remote control bomb. When their fellow cadets, under ALIEC's mind control, attack them Star decides to take matters into her own hands. She crawls through the vent to ALIEC's chamber uses a special mind coin to drive ALIEC totally insane. The computer melts down and the cadets are free. The Bikers boost Star up on their shoulders to show their respect for her. Star remarks how she is finally tall and Lydia says to her that she is always tall when supported by those who love her. Star says: "Then I must be the tallest person in the galaxy." KIDS FIRST!® Adult Jurors say - This script is more than just a sci-fi fiction thriller that entertains. It teaches about friendship and acceptance. I feel that this is an important theme for the age group 12 to 18. The characters are the strongest aspect of the film but the story line is very creative and flows well from beginning to end. It is appealing and engaging and has commercial potential. I can imagine this on the big screen with wild and creative outer space adventure scenes. I give this 4 out of 5 stars and it is perfect for the ages intended. All Star. Description - One classroom, twenty children. Every child keeps committing one specific devil deed in the classroom: lying, stealing, bullying, etc. Every chapter one of these children falls asleep and wakes up to a World with the plenty of welfare: countless toys, countless sweats, countless anything the child desires for. But every child in that miraculous World is treated by the same specific devil deed which the child was committing in the classroom during the day-light. KIDS FIRST!® Adult Jurors say - This is a story of students that have lessons to be learned that are not academic. There are morals to be learned and in this first chapter we learn of young Tom who has a problem with lying. I had some difficulty with the flow of the beginning of the chapter and there was some slight confusion, but the middle and ending did make much more sense and came together. There are quite a few grammar mistakes that should be fixed. I feel that this story does have potential and there are some strengths. NOT YOUR PARENT'S PARADE - PHILIP SURACI, JR. Description - A 12 year old girl, fears the loss of her skateboarding mentor (and secret crush) when he enlists in the Marines. She decides to try to bring him home by ending all war. With her friends, she embarks on a campaign to force all adults to sign an oath renouncing war by denying their parents their love and laughter. Through social media, courage and creativity, the plan takes off. The adults resist mightily. Yet, the children lead a non-violent rebellion that transforms society when the U.S. President finally signs the Oath for Victory Over Violence. KIDS FIRST!® Adult Jurors say - I found this script refreshing, entertaining and in some ways, very positive. I like that it goes against a stereotype of skater boys and girls being bad (at least out here in So Cal) and I like that Lyndsay is a young girl that wants to make a difference. It has a great message that violence and war aren't always the answer and the title really does fit the script. The characters are created well and the dialogue is believable and appropriate for the modern or slightly futuristic times. There is conflict and a satisfactory conclusion and children ages 12-18 would be engaged. The script is well-done. Overall, there are very few grammatical or spelling errors. I did find one word (pg. 18) that I would suggest changing but did not catch any other words. It was easy for me to rate this script with a 4 out of a 5 stars. The language used is appropriate to the age of the characters and I think that young middle-school age kids and teenagers could relate. There is one word that I would suggest changing (on page 18: suckas). I recommend for ages 9 to 18. The characters are its greatest strength. They are likeable, easy to relate to and understand and fit well within the story line. I do think it would be helpful to know what year this takes place in. It is slightly far fetched with a woman President but that is actually refreshing. Another strength is the quality of descriptive writing done by the author. At times, I feel as if I am really there. Nicely done. I do believe that this script has commercial potential. There's a good message and shows that kids can make a difference. The characters are likable and entertaining and it has a somewhat happy ending. I was satisfied with the conclusion. Description - Chris, the ugliest boy in the World, is, however, the most likable and most successful wherever he moves in. His best friend Caroline is a poor disabled girl without a leg. In the first part Chris becomes a super-model. How will Caroline influence his star career? KIDS FIRST!® Adult Jurors say - This film is a short one but packs a couple of powerful messages that would be helpful for kids ages 12-18 to learn such as "Looks are not everything, Fame and Fortune also isn't everything and true friendship is the most important thing of all." This wasn't your typical most popular, good-looking guy becomes friend with the most unpopular girl because there is a twist which makes it creative and unique with humorous undertones. Description - Tee is the first T-Rex ever to walk the face of the Earth and is treated by everyone with unease. When his mom marries the mayor, he moves into town after years of homeschooling and the timing couldn't be worse. The mayor has just signed a deal allowing raptors to come into town and destroy the local forest to build cheap housing. When the town looks to Tee for help, he must learn to overcome his insecurities and defeat the raptors. KIDS FIRST!® Adult Jurors say - The First T-Rex is about the first T-Rex but it is much more than that because it has important messages for kids about standing up for what you believe in, being different and not being a bully. The characters make this script fun, entertaining and bring this script to life. It is appropriate for children ages 7+ but children ages 7-12 will relate to it more because of the fantasy aspect of it. The characters dialogue is humorous and will be easy for children to relate to. The tone is its strength, also important messages. The characters' personalities shine in this screenplay. They make the story. There is a strong message that it's okay to be different and it's not okay to be a bully. The dialogue is suitable for a youth audience. Description - The Ice Dancer is an adaptation of the Hans Christian Andersen classic with a twist. Set in rural New England, this tale weaves a web of romance adventure and fantasy featuring Max, a troll-like character, who becomes good. All his friends try to rescue him and keep him bad. The beauty and grace of figure skating sets the theme for this timeless piece. KIDS FIRST!® Adult Jurors say - The Ice Dancer is quite interesting and will appeal to children ages 8-14. As an adult, even I enjoyed reading it and could see commercial potential. I could imagine the beautiful snow-filled scenery and the characters bringing this story to life. It is based on the Hans Christian Andersen classic and does have a slight familiar ring to it but there is quite a modern-day twist with a lesson to be learned. Good wins over bad in this delightful story of friendship and teenage romance and it is engaging from beginning to the end. The characters' dialogue is a strength of this script. The characters are very strong. It is easy to find Andrew and Sarah quite likable. Even though Maximillian is not very likable, the author does a great job at making the reader go from not liking him to liking him. The story structure is also another strength. It is easy to follow along with the story line and the scenes and characters are described quite well. I do think this script has commercial potential. I think there could be beautiful scenes with the snow and ice and the characters could have real appeal. It's an interesting story line and I like that it isn't too predictable. It's like a classic fairy tale story with a modern day magical twist. I would rate this 8 because I am not completely sure of the time frame. I am assuming it is pretty modern time but it would be helpful what the time frame is. What year does the story take place? I think children today could understand the story and I felt the magic wizard twist really gives it a more modern day feel. I feel children today would be more interested in this story than the classic fairy tale it is based on. The story line is an absolute strength to the script and the conflict and resolution is appropriate. It's typically good and bad evil and magic and typically good wins over evil. But, this isn't so predictable and I think that the twist is very clever on the writer's part. The characters are one of my favorite things about the script. The teenagers are easy to relate to and you can actually picture them in your mind. I think the writer describes them quite well and I like how he actually makes me feel sorry for the evil Maxmillian who really is more misunderstood than evil and turns good at the end. The dialogue seems very natural and fits right into the story line. The lesson or moral simply is that good wins over bad and is portrayed very well in the script. I like that bad actually turns good in Maxmillian's case. A child will get this because the lesson shines through in the script. Other than that, it is very entertaining and kept my interest from beginning to ending. I would likes to know the year this takes place but I am not quite sure if it is necessary. I do not think that I would make any changes because it is entertaining and teaches a moral lesson. I would have liked to know who the woman was that Maxmillian ends up with at the end. She is just brought up at the end but, then again, it is the end and I'm not sure if that is necessary. I feel that the writer does a superb job in writing this story. Description - Youth-friendly comedic drama. A mysterious letter spurs a young girl to sabotage the sale of her sister's prize horse.